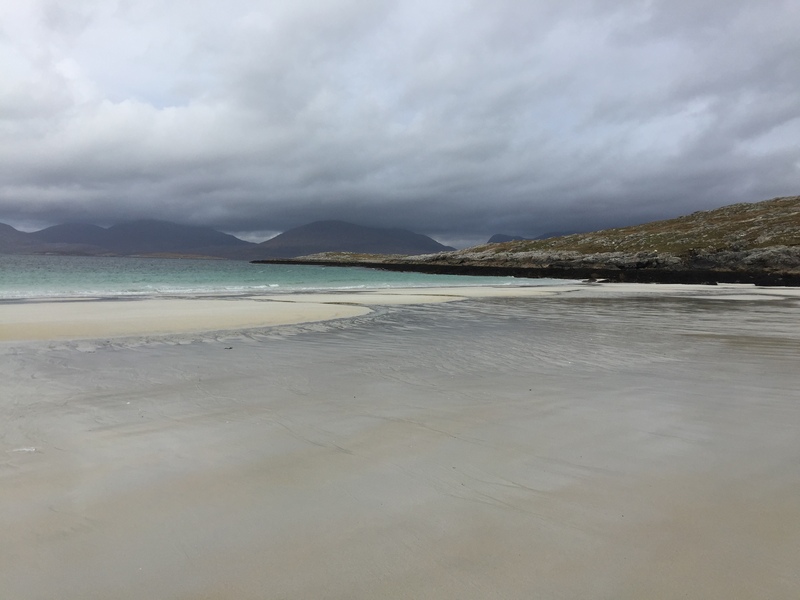 The next part of our island hopping tour comprised of an exploration of the magical Isle of Harris. Similar to Lewis, the island is both strikingly beautiful with natural wonders aplenty. The landscapes of Harris are peppered with magnificent mountainscapes. For me this the biggest difference to the rolling surrounds of Lewis, which are noticeably much flatter. You cross the ‘border’ and enter a winding road through a rocky outcrop, which is truly breathtaking. 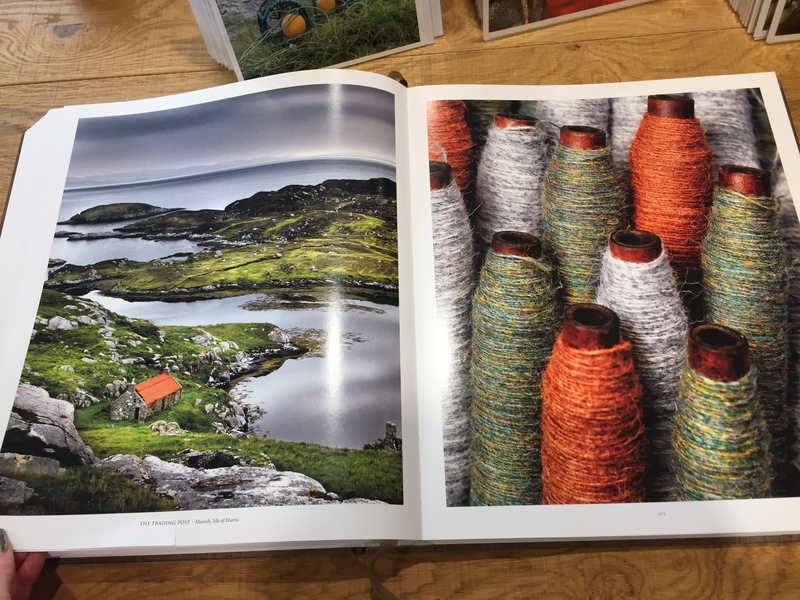 Driving from Stornoway, we stopped off at the Harris Tweed Shop and Warehouse in Tarbet. Driving time was 55 mins and what a beautiful drive it was, so beaut my Kindle remained strictly off for the duration of the drive. The shop was packed full of Harris Tweed gems. 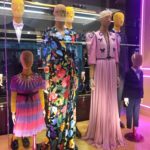 From dog collars and coats to an array of ladies and men fashion pieces and accessories – there is something for everyone in this shop. But don’t expect the prices of Harris Tweed to be less expensive being closer to source. 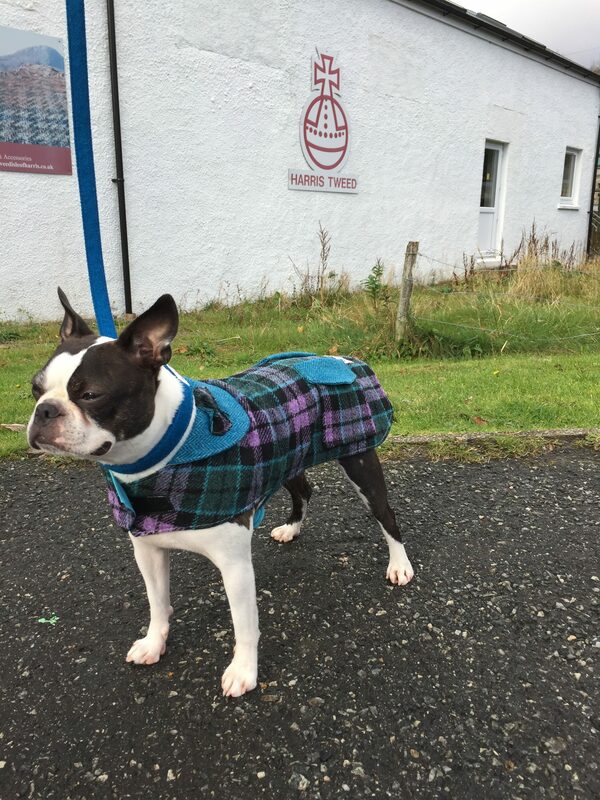 Take for example Haggis’ jacket (in pic below), this was £45 (the same price as the Regatta jacket Lee purchased for himself in Pitlochry a couple of days earlier!). The higher price tag is justified in my opinion what with the amazingly varied colours and quality of the material (which is both hard wearing and warm). 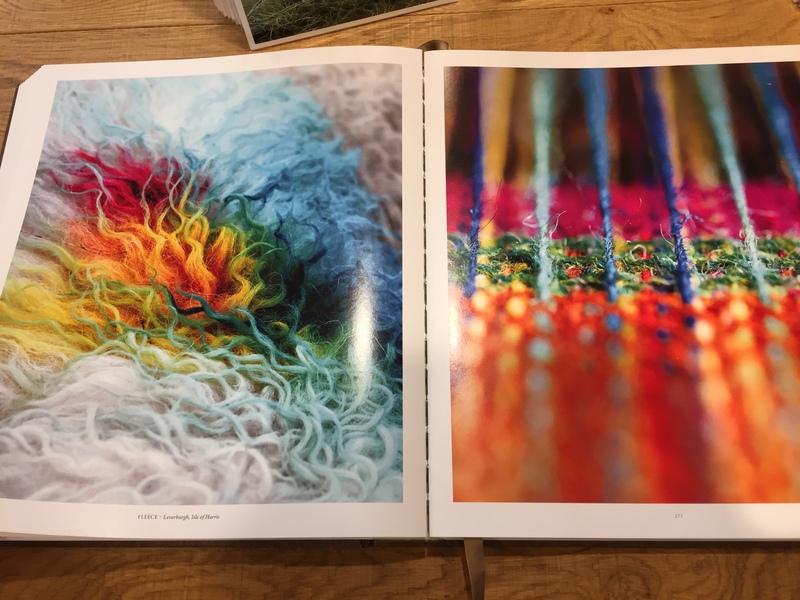 The tones and patterns of the tweeds are inspired by the landscapes of the Hebrides and when you are there, it is easy to see why the weavers are so creatively stimulated. The Warehouse (in the building beside the shop) displays the largest amount of Harris Tweed available. Expect to be greeted by a plethora of floor to ceiling colours and patterns. 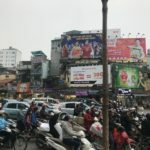 An interior decorators dream, this is definitely the place to visit if you are looking to place a big order for an interior or clothing project. Tip! A great place to find Harris Tweed suppliers online (if you are not able to make it to the island itself) is via the Harris Tweed Authority website. Click here for a history of the cloth and for suppliers. 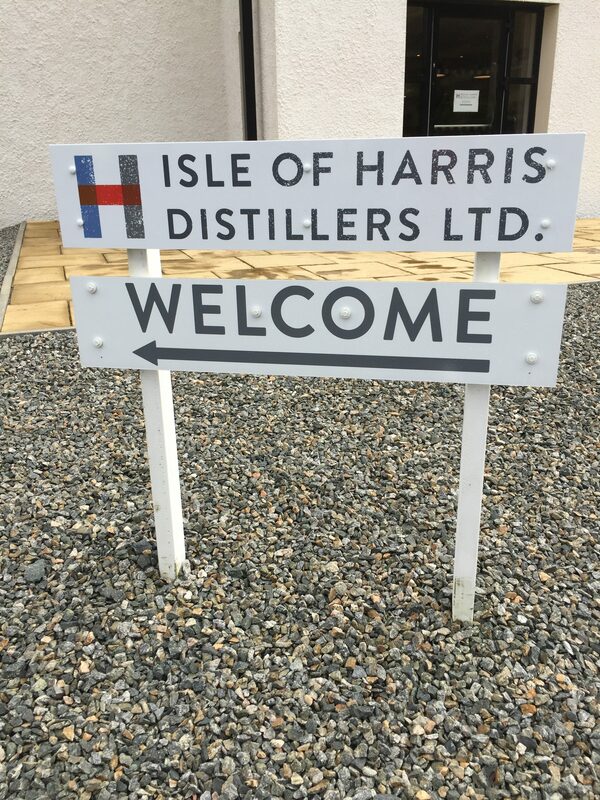 Stand in front of the Harris Tweed showroom, do a 180 and you will see the gorgeously modern structure of the Isle of Harris Gin Distillery. On walking into the distillery the first thing I noticed was the contemporary interiors… and then I laid eyes on the GIN. Styling is clearly important to the clever folks behind the mill. 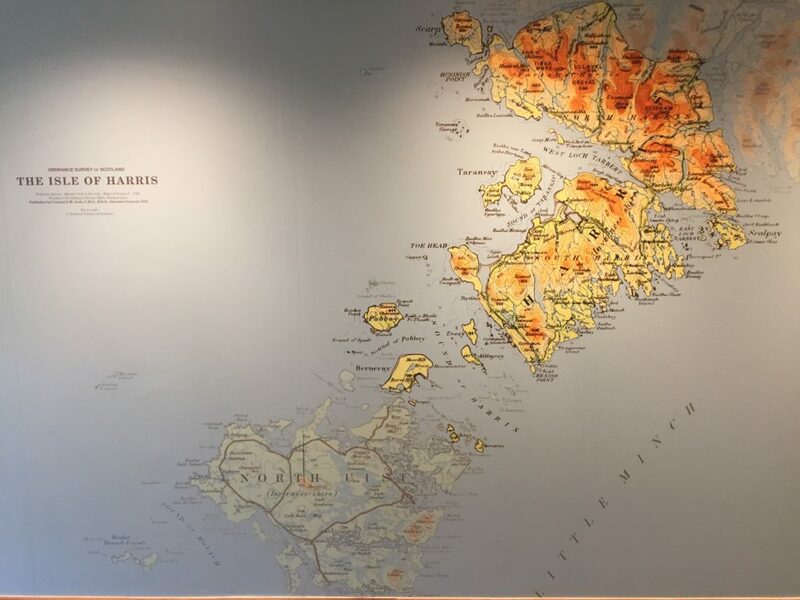 From the architecture of the building, to the interiors that display beautiful maps of Harris and a full wall made of Harris Tweed. Then you look to the design of the bottle of gin itself. 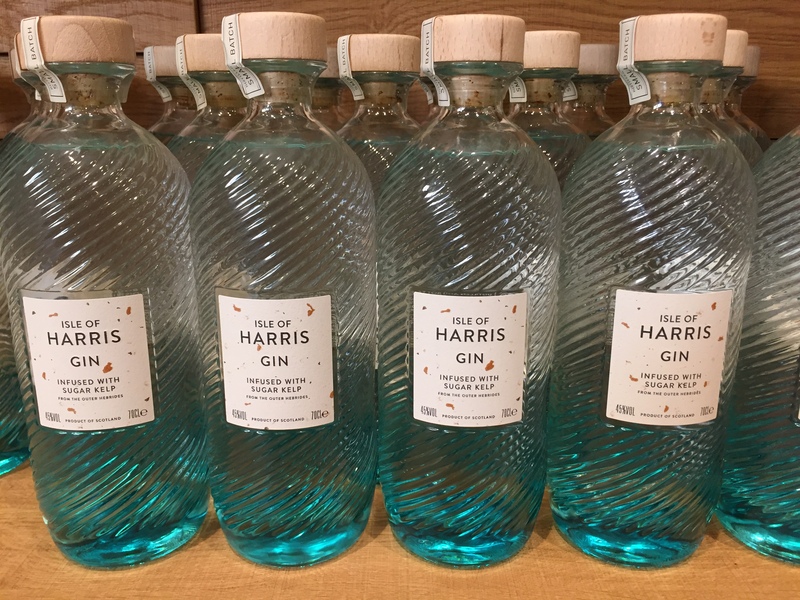 Infused with sugar kelp (which is a sweet tasting seaweed) the bottle design echoes that of waves – a nod to its 9 specially selected maritime and botanical ingredients. It is the inclusion of these specially selected ingredients that help to amplify the ‘elemental nature’ of the island itself and provide the gin with a deliciously different taste (and I have tried many a gin with which to compare). There are five distillers, local men, who work tirelessly to produce a “spirit worthy of our island name”. 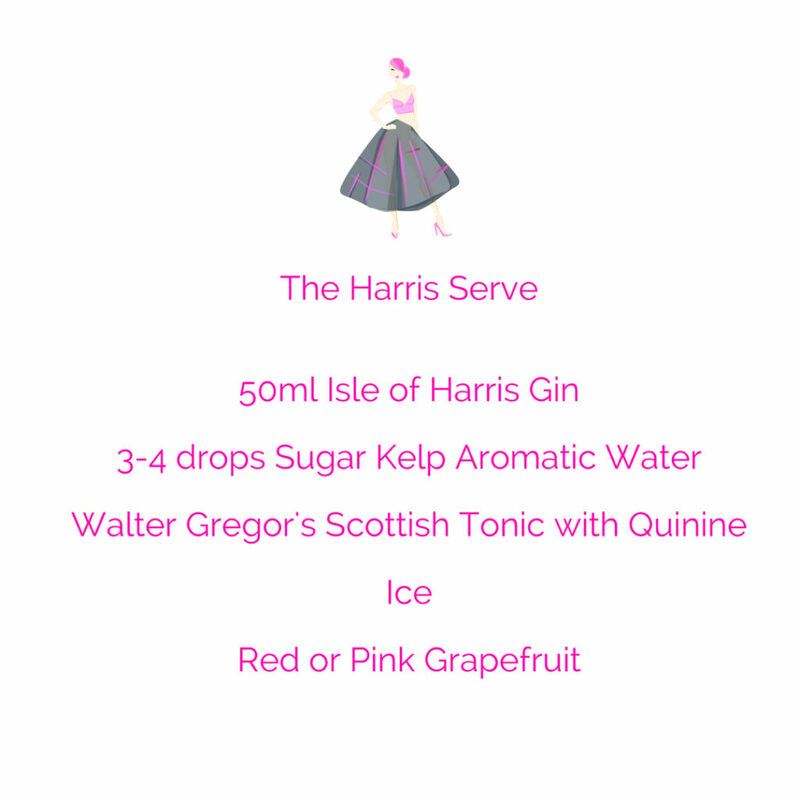 It’s definitely worth checking out the tasting notes for the gin by clicking here. What is the Sugar Kelp Aromatic Water all about? Well it contains Organic Grain Alcohol and Sugar Kelp and to me, it made the gin smoother with a little added taste of the sea (which is nice rather than overbearing). What’s more, it is a quirky added extra when fixing yourself a gin and would look especially cool if you have guests over! Another absolute find was Walter Gregor’s Scottish Tonic, which the distillery champion with their gin. Seriously if you thought Fever Tree was the best, you NEED to try this tonic! If you do plan a visit to the distillery then do so around a mealtime, as they have a lovely cafe serving homemade cakes and local delicacies. Oh and be sure to book a tour if you can. They have now ended these for the winter season, but if you are in a large group of 8 or more you are still in with a chance! Here’s the number to call for booking tours, which is essential to avoid disappointment 01859 502212. Note! Isle of Harris Gin can only be purchased at the Distillery or online, so if you do visit, make sure you stock up! 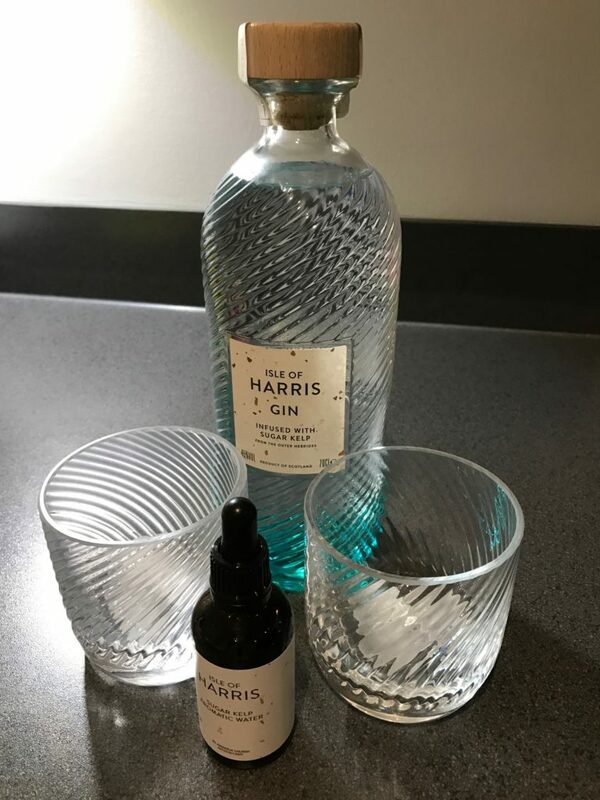 At £35 a bottle, it is worth every penny, especially given the potential uses of the bottle when the gin is long gone (I am thinking vase or water bottle for table when entertaining!). Click here to shop now. The favourite stop by far was Luskentyre Beach. 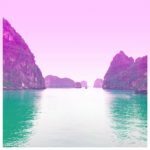 This is the beach that where upon arrival, you seriously have to remind yourself that you are in Scotland (a local informed us that a Thai travel magazine actually used it as their cover image!). Turquoise waters and bright white sands stretch for miles and if you caught it on a Summer’s day, it would be absolute paradise. It truly is little wonder that Trip Advisor named it one of the UK’s best beaches in the 2014 Travellers’ Choice Awards. Tip! Take sunglasses to this beach, as even on a bit of a gloomy day (like we had) the white sands hurt your eyes. No joke! 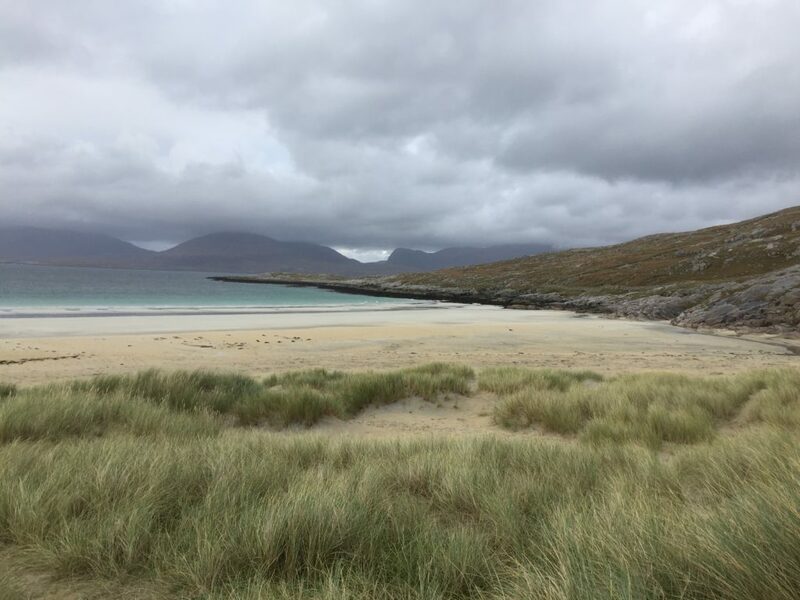 A 24 minute drive from Luskentryre and you will arrive the gorgeous beach of Scarista. Smaller than Luskentyre but still adopting the turquoise meets white theme, this is another great place to stretch your legs. 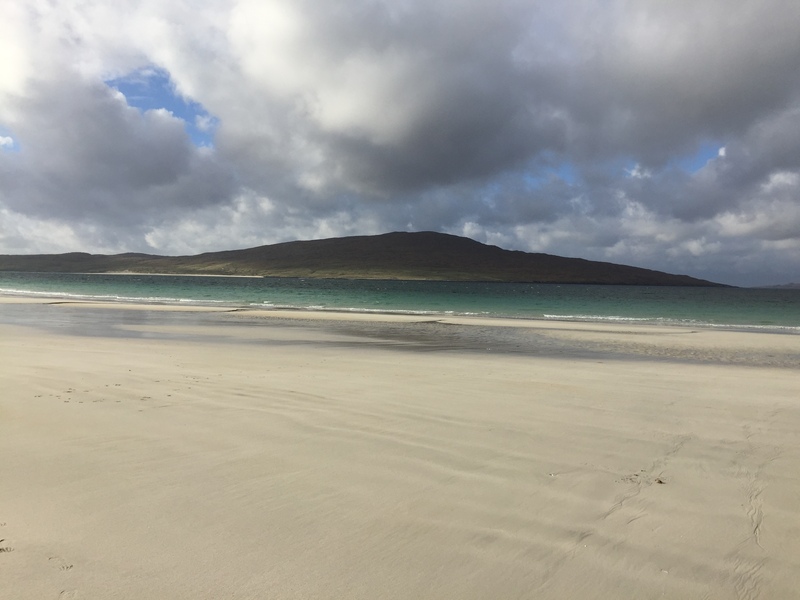 If you are time short however, Luskentyre is the more unmissable. Leverburgh is Harris’ second largest village (next to Tarbet) and it is from here you get the ferry over to the Uists and Berneray. Be prepared that there is not too much to do in this little village. 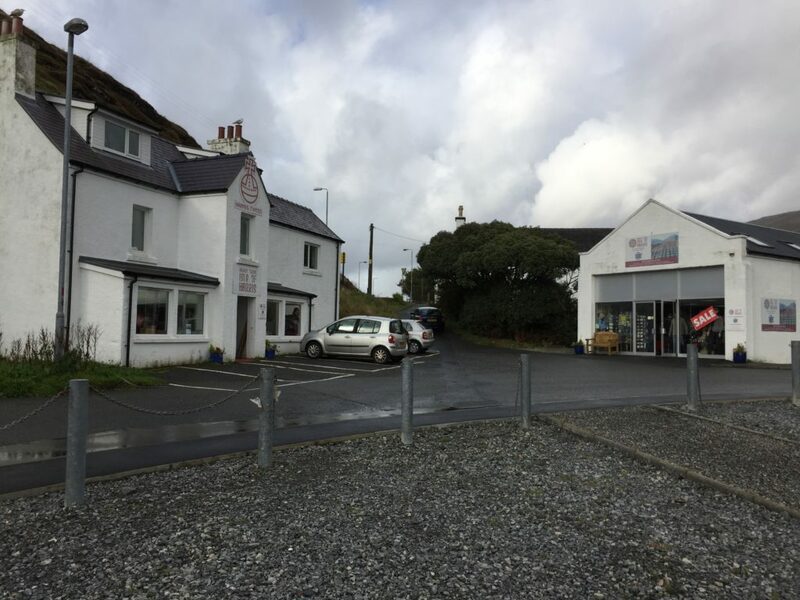 As we were visiting outwith the summer months, the only restaurant at the ferry port was closed, so it was a drive back to Tarbet for us to have some food at the Hotel Hebrides (thank goodness it was only 25 mins – 30 mins away). We stayed in Sorrel Cottage which was a cosy and very well-styled bed and breakfast. Owned and managed by a lovely lady called Paula, you can expect privacy and fabulous service (Paula had to get up at 6.30 to make us breakfast before catching the ferry). 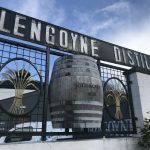 I would highly recommend this dog friendly accommodation, however I would not suggest lingering in Leverburgh itself too long, especially if you are after a bustling village stay. We were pretty gutted there was no pub! The natural beauty of Lewis and Harris is awe inspiring. Please do make sure you put the island on your Bucket List as I am sure it will be quite unlike any other place you will ever visit.